I remember standing at the foot of the stage of the reconstructed Globe Theater in London, watching The Tempest enacted above me. It must have been the year 2000, when I was a 10th grader in high school whose favorite class was English Literature. The trip to London was a high school field trip so I was surrounded by friends my own age, some equally entranced by the play in front of us and others somewhat less so. I remember the figure of Caliban, half-stooped and beast-like in its movements as it groveled at the foot of its master Prospero. I remember there were special effects to indicate when Ariel entered the scene and also to recreate the actual tempests in the play itself. It was a memorable experience and probably the reason due to which The Tempest is my favorite Shakespeare play. When I picked up Hag-Seed by Margaret Atwood I really didn’t know what to expect. We’ve all seen Shakespeare romances reinterpreted for modern times, especially in the form of movies. The Tempest is a bit of a different story and I wasn’t sure how a written modern version of it would fare. I had also never read a book by Margaret Atwood – mea culpa, mea maxima culpa. All my reservations were dispelled within the first few chapters of Hag-Seed. Atwood is a genius who has brought to life Prospero and the entire cast of characters in The Tempest in an incredibly vivid and contemporary portrayal that I could have never imagined possible, but am so thankful now exists. Felix is a hugely popular Theater Director in a Canadian town called Makeshiweg who is betrayed by an associate and fired from his job. He decides to isolate himself from civilization initially, only to accept an offer to take charge of a nearby prison’s theater program disguised as Mr. Duke. Felix decides to use the theater program as the vehicle for the revenge he wants to exact on his former enemies. To do so, he chooses to put on a version of The Tempest, which was the play he had been planning right before his fall from the theater community’s grace. The novel is part of the Hogarth Shakespeare Series, in which popular contemporary authors tackle modern interpretations of Shakespeare’s plays. I’ve included some information on the series at the end of the review, including past novels and future planned installments. The writing. As I mentioned in the intro, I was unfamiliar with Atwood’s writing before reading Hag-Seed. I’m definitely going to try to read everything she’s ever written now. I was captivated by her narration within just a few paragraphs. Her prose is concise and to the point while still descriptive and lyrical. There are tons of adjectives but somehow not a single needless or extra word. In some places I felt she was mirroring the more ornamented aspects of Shakespeare’s verse, picking words that are not commonly used today, and it was so effective at making the reader feel that they were reading a sort of beautiful hybrid between prose and verse. The retelling. It’s not easy to think of an authentic way in which to reinterpret a play about an aged magician who is banished by his evil brother and shipwrecked on an enchanted island with his daughter, before exacting his revenge years later. Atwood’s choice of plot and characters were inspired. Prospero is Felix, whose magic is his ability to enact glorious plays, and the island becomes both the small spartan house in which Felix decides to self-maroon, and the prison whose inmates are enlisted as actors in Felix’s version of The Tempest. In the original play, Shakespeare has Prospero trick his brother Antonio and his accomplices by creating a play of his own after they are also shipwrecked on the island. In the same way, Atwood is recreating a play (The Tempest into Hag-Seed) that has a play at its center (Felix’s portrayal of The Tempest in the prison). She takes it one step further, however, with another play within the play within the play, when Felix enacts a third live version of The Tempest on the people who have destroyed his theater career in order to exact his revenge. The summaries of the original play provided to refresh your mind. The last time I read Shakespeare’s The Tempest was at least 10 years ago in college. If you decide to read Hag-Seed and are as rusty on the plot of the actual Tempest as I was, you don’t have to go online and look for a synopsis to refresh your mind. You can either read the quick three-page summary of Shakespeare’s original play that is provided at the end of the novel, or you can also wait for Felix to explain the plot of The Tempest to his inmate-actors once he decides to have them interpret the play. The theater program that Atwood has Felix run in the prison within the novel actually begins with portrayals of some of Shakespeare’s more straightforward plays like Macbeth and Julius Caesar. It’s in year 4 that Felix decides to broach the play that preceded the wreck of his career. The way in which the racial discrimination theme was included. The Tempest has an unfortunately timeless aspect to it in the character of Caliban, a half-man half-beast who is subjugated to educated, white, noble Prospero. When Felix explains the nature of the character to the predominantly POC inmates in the prison, none of them initially want to play the part. Atwood justifiably explains that as the prisoners have been considered Calibans all their lives, they know it’s a thankless role. By bringing The Tempest into a predominantly POC inhabited prison and demonstrating the tension between something frivolous like a play reenactment and the real hardships and injustices experienced by the prisoners, Atwood brings a contemporary depth to the racial element of the original play. The prisoners – Caliban and his Hag-Seeds – even rap in some of the play’s scenes, bringing a different modern cultural element into the play, which further updates the play’s message. The extra chapters at the end. The actual plot of the novel ends with a bang – there is an exciting final scene full of action, justice and redemption. Right after, however, Atwood includes 3 or 4 additional chapters in which the actors/prisoners reunite after the play and discuss what they think the destinies of their characters might have been. I thought that though these chapters were not unpleasant or uninteresting to read, they felt like a tag-on to the novel and diluted the potency of its finale. A lucid, lyrical and visionary retelling of one of Shakespeare’s most unusual plays, which will make you feel Shakespeare’s versatility and the artistry of Atwood’s prose. 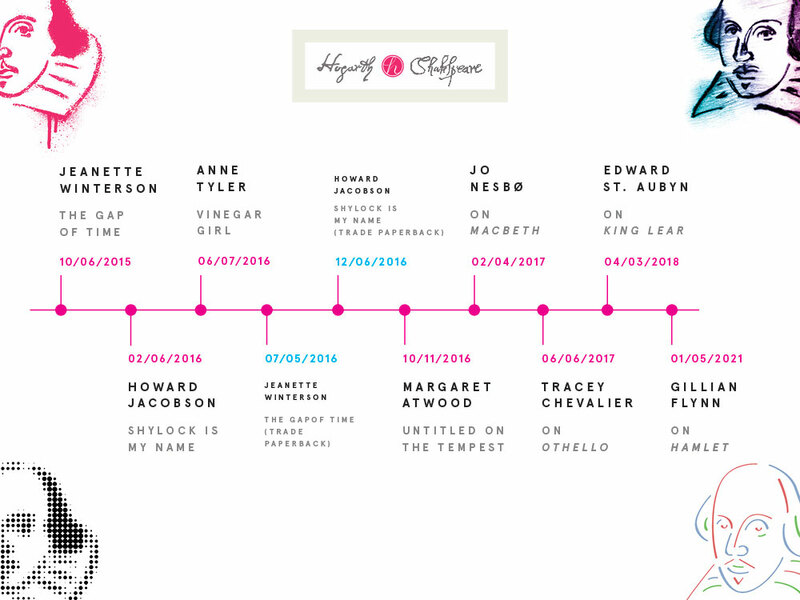 Here is a graphic from the Hogarth Shakespeare series website that shows the three novels in the series that have already been published in addition to Hag-Seed, and the future ones that are planned. I’m definitely excited to explore the past titles while I wait for the new ones to be released. Have you read Hag-Seed or any of the other backs in the Hogarth Shakespeare series? What did you think? Leave your opinion in the comments! I received a copy of this book from Blogging For Books in exchange for an honest review. This post includes affiliate links from Book Depository. So glad you liked this. I did too. I thought it was cleverly done. And agree on the last few chapters – they weren’t needed. I hope you continue to enjoy Atwood, one of my favourite authors. Thanks! Is there a book of hers you’d recommend above the others that you think I should read next? My all time favourite is The Robber Bride but it did get mixed responses at my book club. The Handmaids Tale and Cats Eyes are probably the classics from her earlier work. Plus Alias Grace. I really liked the Maddaddam series but I have to say they took a while to “get”. Not sure if that helps? I am planning to read this at some point. I love the concept of the Hogarth retellings, although I have only read Vinegar Girl, which was just okay. I just recently read my first Margaret Atwood book, and I am quite taken with her writing, so I am hoping to like Hagseed. I’ve been tracking down these re-visions of Shakespeare and will add Atwood’s.